To prime myself for the start of a reading tour promoting Beautiful Like a Mayfly, I went fishing. No surprise there, right? 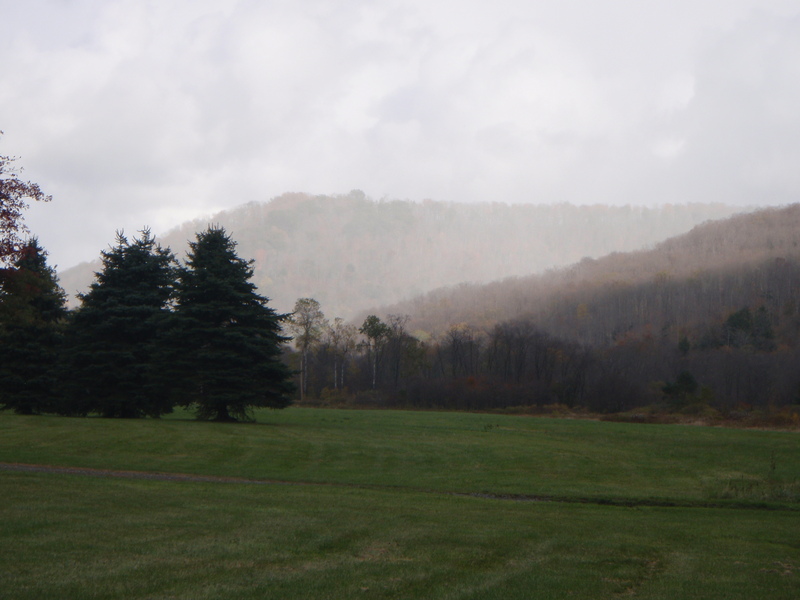 It was a cold day with snowflurries and an air temperature never climbing out of the 30s. There was no one on the upper Allegheny as far as I could tell; the guys were probably out bow hunting or watching their favorite football team. 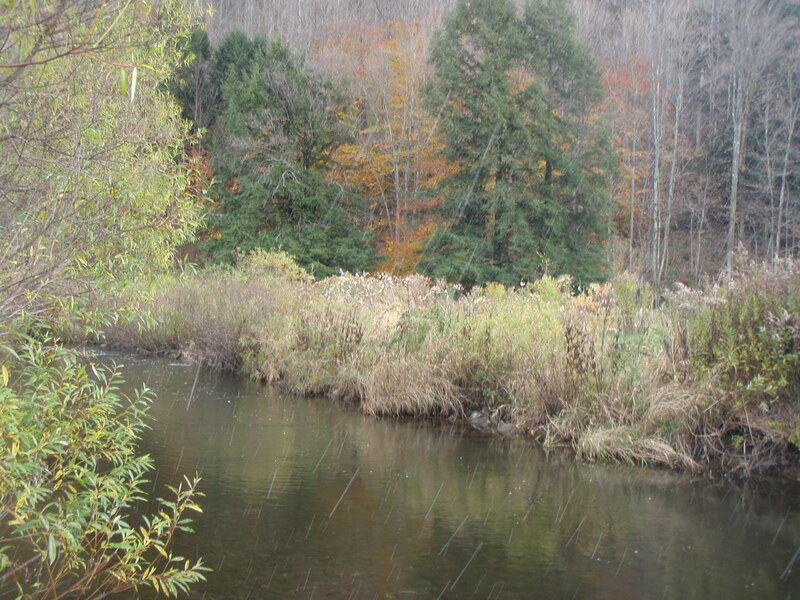 I caught some rainbows on a wet fly, but as the snow began to thicken in the air above the woods and river, not even the Blue-winged Olives dared to fly. The kick-off for the reading tour was a minor event. I fielded some interesting questions and, admittedly, was taken aback momentarily when someone asked, “So what’s the point to what you’re saying?” A legitimate question, and I’m thankful for it. I answered as kindly as I could. “…I tried unsuccessfully to define the no-man’s-land between description of a place and its reality…” (from “The Meadows” in Beautiful Like a Mayfly). My second stop on the tour was (again) a small event but this was more like a “party.” To celebrate those moments, I went fishing the next day with my friend Tim (no surprise there). 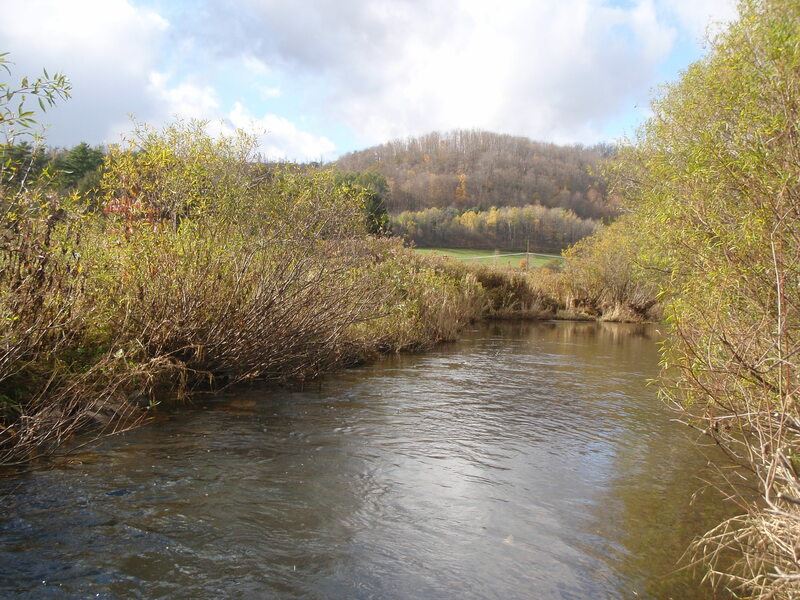 We headed north to look for brown trout in the Lake Ontario tributaries. I mentioned in last week’s post that the water level then was low and that the salmon run had barely started. This week the level of our tributary was just as low, and the run of trout and salmon still appeared to be in the earliest of stages. Everything seemed to be waiting for rain. Great swaths of our country were on the verge of drowning from super storms, but here the tributaries were as thin as skeletons wrapped in rags of green and blue. We saw only one or two brown trout the entire time. Even the chinooks were relatively scarce. At this time of year, the creek is usually fairly rank with decomposing salmon, but we saw just a carcass or two. The salmon weren’t numerous, but you could see a few ghosting about in the deeper pools, or battling upstream, fresh and green-toned from a life in Lake Ontario. 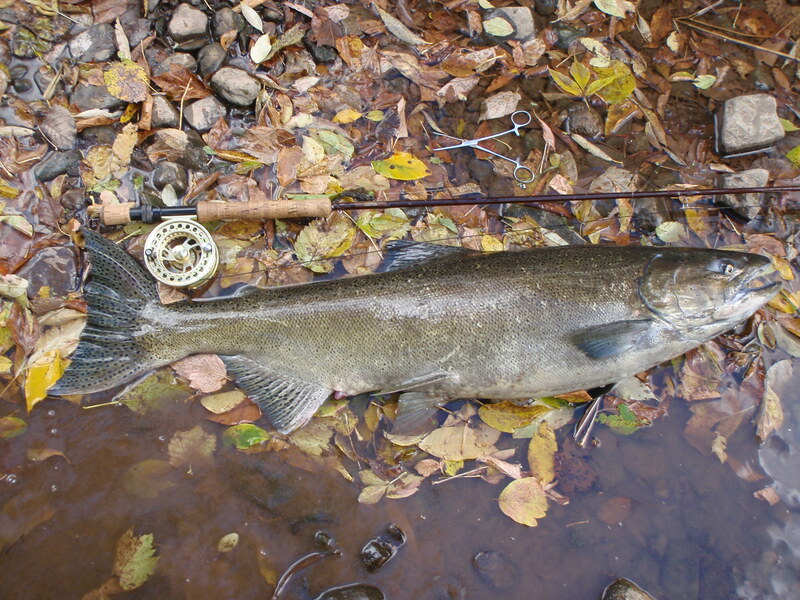 I caught one fish, a vibrant king that measured 44 inches against the nine-foot rod. This baby proved to be the largest I have ever landed and released. Its girth was massive; an easy 25-pounder. I sent it home safely to its pool beneath the willow boughs. What’s the point of casting for a fish like that? 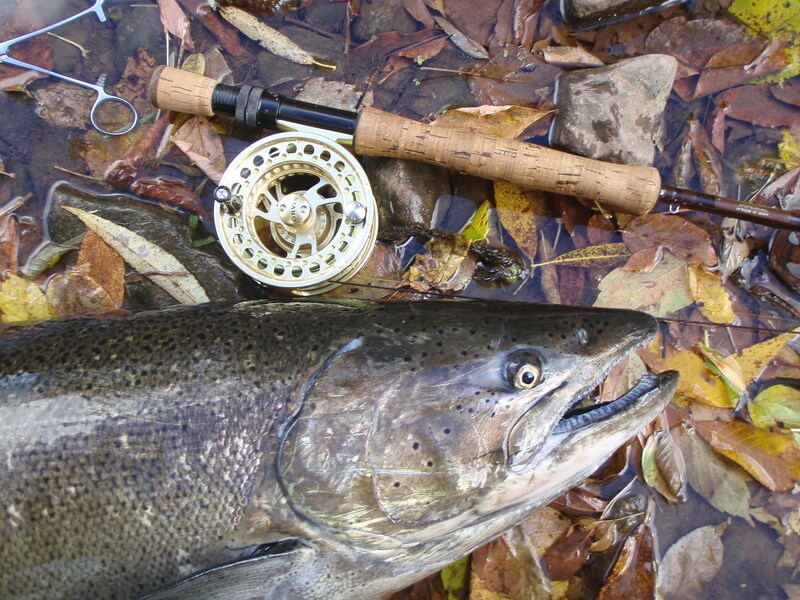 A lot of anglers sniff at the idea of catching big Pacific salmon for reasons I’ve never been able to fathom. Maybe they’re the ones who are still reluctant to admit that kings and cohos will strike at a fly or other lure while on their one and only spawning run. The sheer butchery of snagging salmon on their spawning run was legal in New York until the 1990s when the state finally determined that these powerful and majestic creatures could be taken fairly in a manner other than being towed out with a 30-pound line and a giant treble hook. My one fish this day was fooled by a swipe at a #6 Woolly Bugger on a 12-pound tippet. If I had to catch fish like this every day from here on out, I’d need a metal plate in my gut to brace the bottom of the fly rod, and I wouldn’t last for a month. 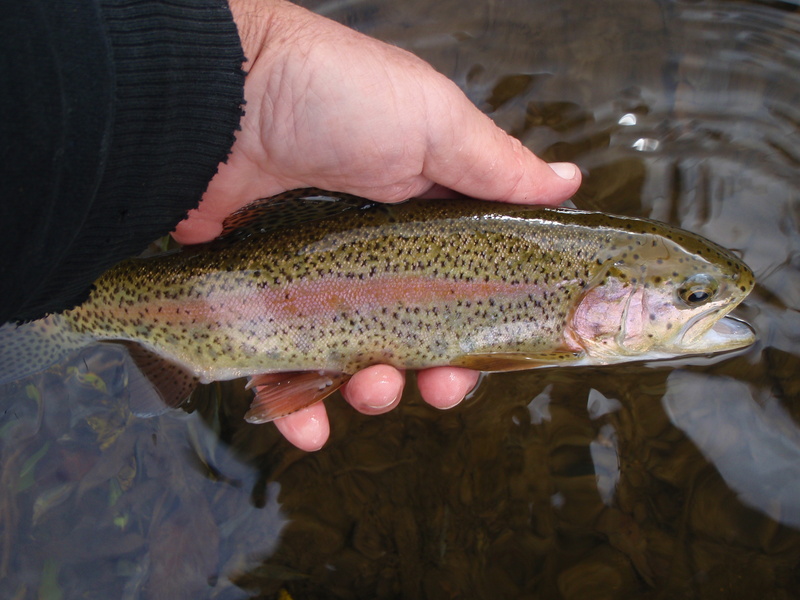 The big fish, trout and salmon, are a fun diversion for a while and they broaden the angling horizons, but I’m really looking forward to returning to the rivertops where fish are small and beautiful and where light can be refracted from a mayfly’s wing. I hope you’re not surprised by that. another fish tale by the rambler? This entry was posted in Uncategorized and tagged Beautiful Like a Mayfly, big fish little fish, brown trout, fishing, flyfishing, ghosts, glass fly, illegal snagging, king salmon, Lake Ontario, mayfly, nature, photography, rainbows, reading tour, salmon, surprise, tributaries. Bookmark the permalink. First, Mr. Black Gums – WOW! What a fish. Second, you could’ve explained to the inquisitor that you are an “idler” and that lack of an agenda or “point” beyond indulging your curiosity is exactly the point…then maybe writing about it afterward for your fellow idlers to enjoy! Maybe if I had a road manager, Bob, I’d be more relaxed when confronted by pointed, or pointless, questions, and thereby prove that I’m an Idler with a hidden point to make– or something like that! Any takers? Or what would be the point in that. In any case, I’m Yours, in Idleness. Another delightful entry, enjoyable as always, and very nicely located right where it needs to be! Thanks so much for your support and words of encouragement, Mr. PlaidCamper. Glad that you’re enjoying BLAM! Yeah, we who teach do enjoy a challenging question, seldom getting enough questions with a point to be made, and we especially like to field them when they pertain to our beautiful fields and streams. I’ve got to thank you and your blog, also, for the recommendation of RR to the blog, Mountain State of Mind. She’s got a good thing going over there. I will have to get your book. Good point, that everything doesn’t necessarily have a point. My students are not into learning. Their questions are designed to elicit the answers to test questions. All else is extraneous. While they are young, they find the rationale for the answer, the application of the answer and the extrapolation of the answer to be frivolous,time consuming and wasteful. Sometimes i find all the add-ons to be the most interesting thing. And sometimes I find the answer merely to be the stepping stone to a greater platform. And, yet, sometimes a cigar is just a cigar. But the examination of such makes us more knowledgeable and leads to a greater understanding of life itself. And sometimes that is where we go with our own Rivertop Rambles. I am glad you share yours. An excellent statement, Jack; thank you for that. Although my students are probably younger than yours, they too lack, for the most part, an ability to think critically and go beyond the desired answer to a test question. Teaching them to think critically, to enjoy the learning process that can lead to knowledge of the self and of the world is a damn tough job, rewarding but all too often frustrating. “Sometimes a cigar is just a cigar.” True. But examine the variance of cigars, their sources, smells and tastes, their smoke rings dissipating in the air, and we’ve got a bright new world. I hope you’ll order my new book and let me know, eventually, your thoughts about it. Meanwhile, all the best to your efforts in the classroom, home, and world outdoors. First off…nice fish Walt. I’m glad I’ve never had to answer a question like, what’s the point? 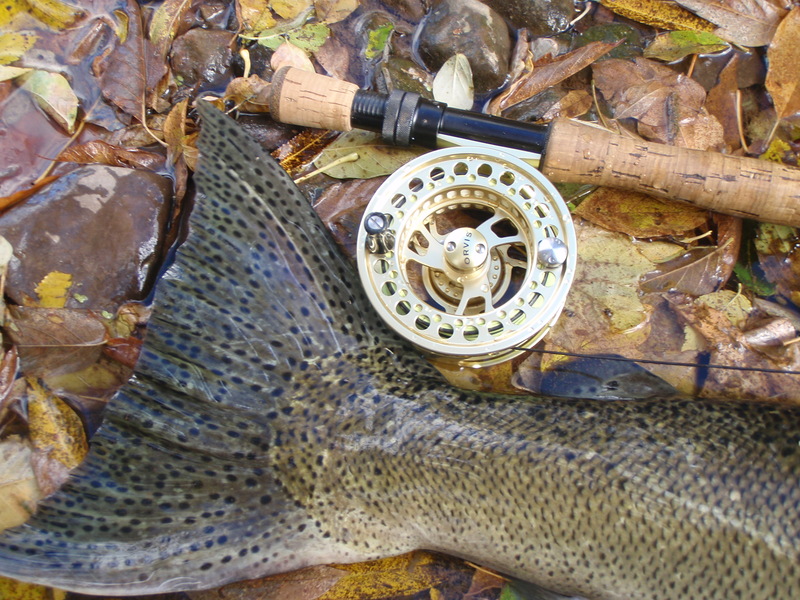 The point, is a secret that we can only share with our fellow fly fishers. But then we really don’t have to tell them do we? Right to the point, Howard, thank you, and well taken. The questioner, in this case, was not a fly fisher or in any way that I could tell a person of outdoor experience. One needn’t have that experience, really, to appreciate a work like this, but I think that someone predisposed to a love of earth would get “the point” pretty quickly. Thankfully we don’t have to clarify this sort of thing to most of the people we interact with. Wonderful thoughts Walt. I agree that is an impressive fish. Thanks Alan. Yeah the fish was a bundle, and I’m glad it swam away okay. Nice post Walt. Good luck on the book tour. Let me me know if it brings you out my way. Thanks Leigh, and I hope you received your copy. I don’t know when I’ll get out your way again, but I’ll keep you posted, for sure. I did receive my copy and am about 100 pages in. It’s a very enjoyable read. Glad you’re into the book, Leigh! Not surprised at all by that last sentence! I have felt the same way myself. 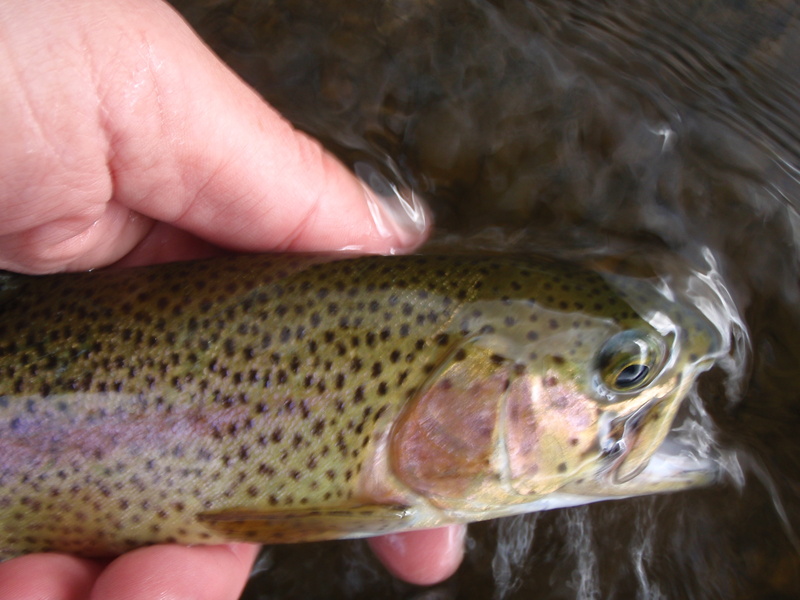 Variety, even in fishing, keeps things fresh but most days I would trade the excitement of tangling with a big fish for the simplicity of fishing for brook trout on some quiet brook. Congrats on the King! Thanks for that, Mark, and for understanding that variety in fishing/outings is the spice of it, though there’s nothing to take the place of those sweet little streams in the wild. And it would be hard for me to describe what it’s like, but this is where a good rod and a good dependable reel come in handy. Yes, the colors remain, even this late in the season, from the oak leaves to the rainbow trout and beyond… Thanks for reading and commenting, Bill. BLAM! I love it Walt. I am saddened by the ignorance in questions that shouldn’t need to be answered to, What is the point? What’s more saddening is that there are actually people out there that have to ask, What is the point? in anything connecting our everyday lives to the natural world. You no doubt handled it in a completely professional manner. I couldn’t be sure I would have, but then, that would only lower me the questioners level of ignorance and I couldn’t have stood for that either. That is one hell of a catch there brother. And I see the point all the way from North Carolina. BLAM! Thanks for getting the point so naturally, Doug. It’s the understanding that requires little or no explanation and helps promote a brotherhood and sisterhood of social warriors who stand up for the ground we all walk upon. As I said, I do embrace all comments and suggestions here on the blog and in the reading rooms, but occasionally there’s someone who misses the point entirely and doesn’t really care to see one other than the preconceived. That can leave a hole in the heart if allowed to fester, but knowing that there’s plenty of friends and pilgrims like yourself out there, we soldier on and have some fun. Btw, I’m really diggin’ that CD again, the one with your guitarist friend. Pure poetry. BLAM! ON. 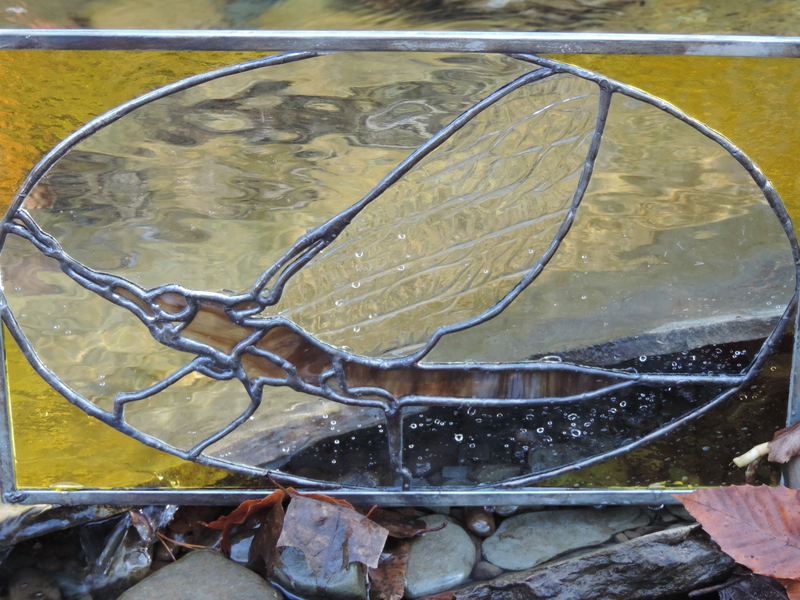 Beautiful Like A Mayfly my friend. I just registered my ISBN to BTRR, so with any luck, before years end, I’ll be able to have printed books in hand. Glad you are re-enjoying my CD with Jaimie Willard, Where It All Began. Something I am quite proud of. With more luck my way, I’ll have my book and yours, in hand before 2016. You are someone whose opinion I very much appreciate. Peace, d.
Good luck with it, Doug, and I look forward to seeing the same. That being said, as with many of the other commenters, I’m really enjoying the book! There’s of course an extra element for me to read a part of the family history, but I think it’s beautifully written. Glad you did it, point or not. You make a couple of spot on points in your first paragraph. And you know, I’m not really certain either what the questioner had in mind when asking, and I more or less answered by providing several sources of motivation and inspiration. Some people can’t be bothered by anything they’re not used to; others (luckily enough) look for edification, and that’s fine with me. That said, I’m happy that you see a point to the book, enjoy it, even beyond the fact that your name appears within on several occasions! Walt, you know, the point is, that all of your experiences mean something to you. And, in sharing, they mean something to kindred spirits. Some won’t get “it”. As the saying goes, “if I have to explain it, you won’t understand”. Nice post too. My arms are sore just looking at that salmon. Well said, and thanks Les. Either I’m slowing down or the salmon are slowing down (or both), but there were years when I could go for an afternoon and land a dozen or so of these fish because they crowded a stream or river. Talk about soreness….